One-hundred-and-seven dogs - including some nursing puppies - have been rescued from a "horrific" and "filthy" puppy mill in Louisiana, where they were found covered in their own excrement from being forced to live in tiny crates stacked from floor to ceiling. 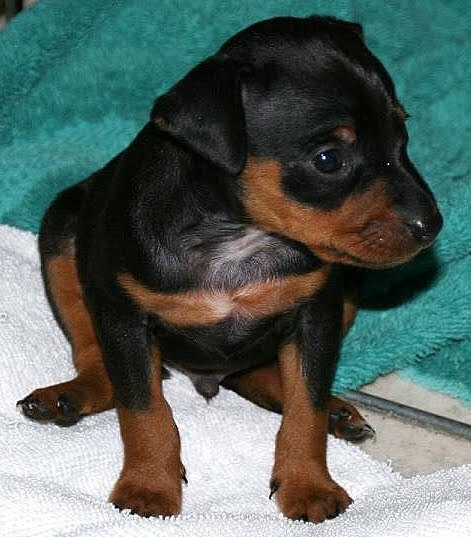 Three have given birth to 12 puppies since being rescued. 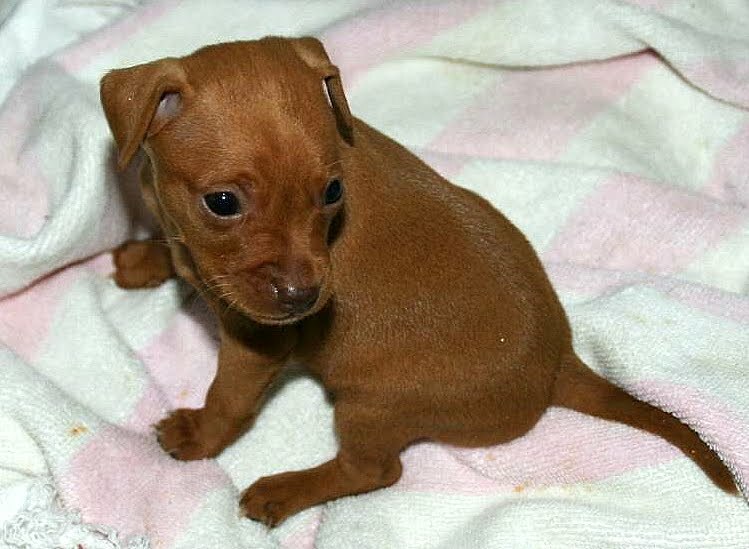 The dogs - about 60 Miniature Pinschers, 20 Rat Terriers, 20 Chihuahuas and four Pekingese - are suffering from severe eye infections as well as emotional trauma from being penned up long-term with virtually no human contact, according to an animal welfare official. One dog is blind and deaf and has a another with a broken jaw and heart worms. The conditions were so deplorable at the puppy mill at a house in Robert, Louisiana, that rescuers had to wear gloves and masks when removing the dogs, according to Susan Lancaster, administrative director at Saint Francis Animal Sanctuary in Tylertown, Mississippi, which assisted in the rescue and is caring for the dogs at its 48-acre ranch. 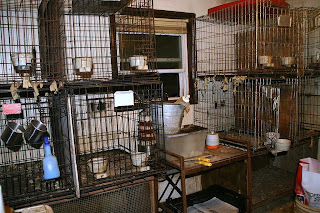 "Three of the interior rooms (as seen at left in this photo from the sanctuary) were set up with crates stacked floor to ceiling," Ms. Lancaster told MySetterSam. "The crates were encrusted with piles of excrement. The dogs were covered in their own filth. The whelping rooms (the interior rooms) were so bad that everyone had to suit up with masks and gloves." The conditions outside the house were just as bad, Ms. Lancaster said. "There were rows and rows of tiny pens packed full of females and males for breeding. 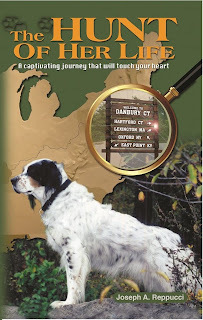 Those [pens] were in such a horrific state, volunteers had to hose the entire area down before before we could even assess how many dogs were out there." Police discovered the puppy mill after the owner of the house was killed in an automobile accident. Officers went to the home to inform the family and found the dogs - as well as 12 horses, two ponies, five goats, and seven roosters and chickens - living there in squalor. Three of the Miniature Pinschers have given birth to 12 puppies - like these two of left in photos from the sanctuary - since their arrival at St. Francis Animal Sanctuary and two others are pregnant, Ms. Lancaster said. All the dogs are receiving medical care and are improving daily, but the 10 to 12 dogs with eye problems - such as cataracts, glaucoma and cherry eyes - will need to be treated by an ophthalmologist, Ms. Lancaster said. "Those will be the most extensive in terms of medical rehabilitation." 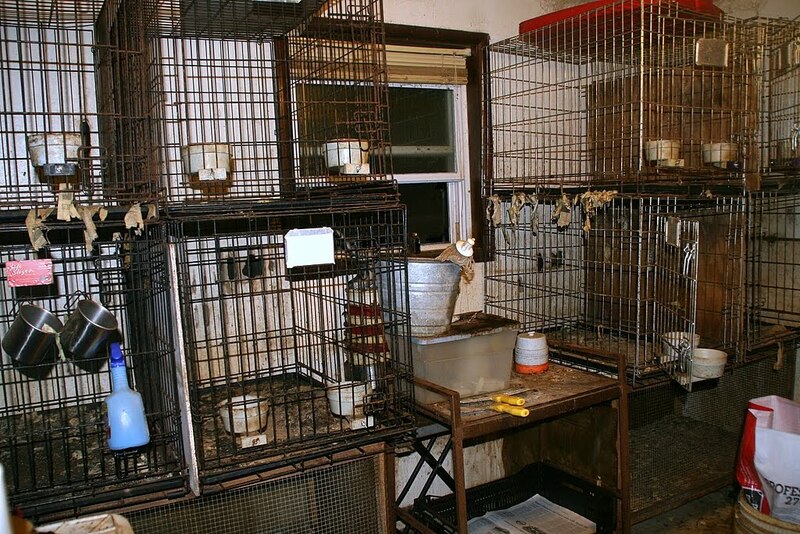 The conditions for the Pekingese - like this one at left in photo from the sanctuary - were especially difficult because of their long fur, which became matted and entangled with urine and feces, according to Ms. Lancaster. They are suffering from severe skin rashes and are being treated with antibiotics. 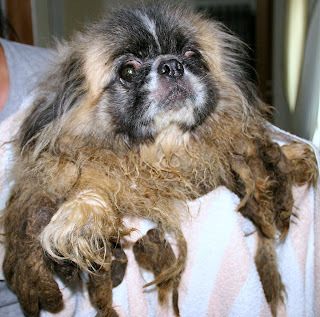 "The Peke's were in terrible shape. ... all of them were matted beyond belief, caked with feces," Ms. Lancaster said. "Dreadlocks just hanging from every part of their little bodies. One little girl, Queenie, was so matted she could barely move. Once she was shaved down, she was so happy and excited she was wiggling and dancing around - a real 'Dancing Queen,' hence the name Queenie." Some of the dogs that are in better physical and emotional condition will be available almost immediately for adoption, but others - like some of the older ones that are timid from lack of human contract - will need more more time for socialization training before they can be placed into homes, Ms. Lancaster said. "Many of the older ones are still extremely shy and afraid, though they are slowly getting used to our attentions." Ms. Lancaster believes the no-kill sanctuary will eventually find homes for all the dogs. "We are extremely hopeful that all of the dogs will be rehabilitated. Naturally the oldest are the most under-socialized and will likely take the longest before they are ready for a home," she said. "Also, the dogs with the eye issues that need surgery will be slow to rehabilitate as well. But our hope is that every one is able to go to a home. Should any of them not be placed, they will be able to live out their lives here at the sanctuary." Ms. Lancaster estimates that the cost of care and rehabilitation for the dogs will be more than $24,000. "The vast majority of that expense is their medical costs - spay/neuter, vaccinations, de-worming, surgical procedures for those with congenital defects and eye disorders," she said. Residents in the area have been supportive of the sanctuary's efforts to help the dogs and have donated 10,000 pounds of food, but more help is needed, Ms. Lancaster said. "We have had a huge response from the community about this rescue effort. We appreciate all the support we've been given thus far, but the toughest part has just begun and we need the momentum to stay high. We will continue to need volunteers and donations to support this effort." Some items the sanctuary needs are towels, sheets, fleece blankets, liquid laundry detergent and fabric softener, simple green all purpose cleaner, bleach, paper towels, disposable puppy pads and stainless steel dog dishes. For more information about making donations to the sanctuary or adopting the dogs, visit Saint Francis Animal Sanctuary.